Last weekend’s brief government shutdown was — above and beyond any other factors — triggered by a clash between the parties on immigration policy. So Congress watchers have for months been looking for signs of progress in the fitful negotiations on what might be America’s thorniest domestic political issue. But to make things even more complicated, the landscape has shifted even since the shutdown ended on Monday. Just yesterday, the president suddenly upset his restrictionist supporters by announcing he was open to letting Dreamers “morph” into citizens after ten or 12 years. Then a report emerged that Senate Democratic leaders — unlike House Democratic leaders — were ready to “de-link” immigration talks from spending negotiations, presumably giving up the leverage of threatening another government shutdown to secure relief for Dreamers. So it appears that after months of negotiations, a bipartisan Senate agreement, and at least two earlier moments when the president seemed ready to leapfrog his own party and resolve the gridlock, the conflicts over immigration policy are becoming more, not less, complex and intense — and that it will take some wizardry and perhaps smoke and mirrors to get a deal. Of course, Congress has been largely paralyzed on immigration policy for years, certainly dating back to the failed effort by George W. Bush to overhaul the system and create a “path to citizenship” for the undocumented, back in 2007. As recently as 2013, the Senate passed a “comprehensive reform” bill that included sweeteners for conservatives. It appeared to be strongly supported by public opinion, and had lots of momentum. It was dead on arrival in the House. Congressional resistance had a lot to do with Barack Obama’s decision to deal with Dreamers via the DACA executive order that Donald Trump killed in September (with the six-month implementation delay that ends in March). But hard as it was to cut a deal in the old days, it’s harder now. The old dynamic of Democrats and “Establishment” Republicans pushing for some semblance of “amnesty” for people already in the country in exchange for tightened immigration enforcement to cut down on future influxes of the undocumented isn’t that simple any more. There are now multiple points of view in both parties, along with a president whose course of action cannot be predicted with any confidence. 1. Republicans are more deeply split on immigration policy than ever. Lindsey Graham, co-sponsor of the bipartisan Graham-Durbin proposal that was rejected by Trump just before the shutdown crisis enveloped Washington, represents the steadily shrinking but still living tradition of “comprehensive” immigration reform within the GOP, which is still supported by much of the business community and is something of a categorical imperative for Latino Republicans. The center of gravity among Republicans, though, is the default House GOP position demanding many billions of dollars in border enforcement in exchange for limited rights for Dreamers and other undocumented immigrants, falling short of citizenship. And both GOP factions are now being eclipsed by the New Nativists epitomized by Senators Tom Cotton and David Perdue, the House Freedom Caucus, and presidential advisers Stephen Miller and John Kelly, who want fundamental changes in immigration policy to restrict entries and skew them toward “skilled” applicants, which skeptics consider a euphemism for “white.” It’s anybody’s guess what the “Republican position” on immigration is at the moment, though it has clearly been drifting to the right. 2. Democrats have their own divisions on immigration, mostly involving tactics. If the GOP has been moving right on immigration policy for years now, Democrats have been consolidating around both support for a “path to citizenship” and relief for Dreamers. There’s really no significant “get tough on immigrants” faction in the Donkey Party anymore. But as became evident during the process that led to the reopening of the federal government on January 22, moderate Democratic senators in red states are not inclined to back up immigration demands with a shutdown threat. They view that approach as playing on Trump’s side of the field. 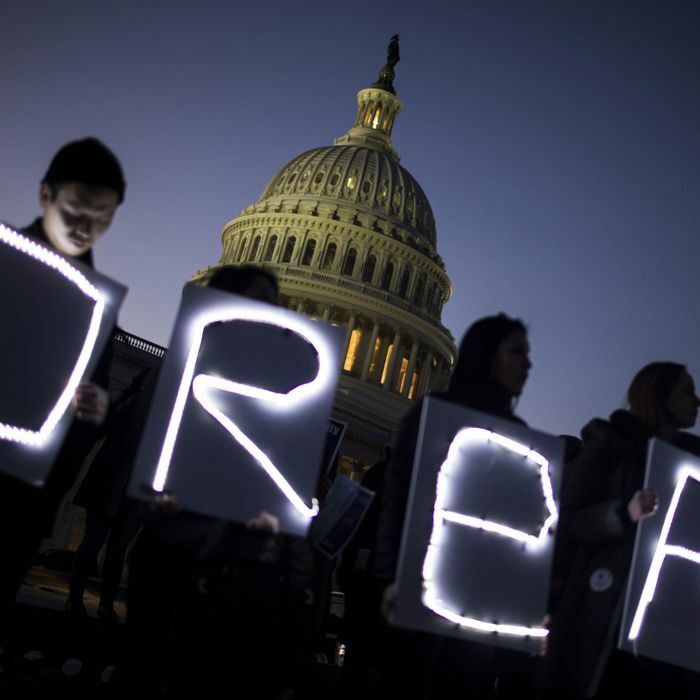 But particularly after Senate Democrats “folded” on January 22, a sizable number of senators (including the 16 who voted against reopening the federal government) and perhaps a majority of House Democrats now feel obligated to go to the mats for DACA and against concessions to the nativists going forward. There are, as mentioned, now reports that Senate Democratic leaders are willing to “de-link” the immigration talks from the spending negotiations needed to keep the government open beyond February 8. Such a decision will be bitterly opposed by immigration advocates. It all comes down to a promise Rep. Paul Ryan (R-WI) made in 2015, before taking over the speaker’s office: He assured the most conservative members of his conference — the very ones who ousted his predecessor John Boehner — that he would not let an immigration bill pass without the support of the majority of House Republicans. That will be tough to secure. And for what it’s worth, House Democrats are significantly more militant than their Senate counterparts when it comes to what they are willing to say and do to rescue Dreamers. But the new restrictions and policy changes conservatives (and the administration) are demanding with respect to legal immigration are much less malleable. Ending “chain migration” is of vital personal interest to a lot of legal (and undocumented) immigrants already in the country. So, too, are proposed permanent restrictions in refugee entries, and the recent actions by the administration ending Temporary Protected Status for Haitians and Salvadorans. Ending the “diversity visa lottery” would, many African-Americans believe, skew immigration patterns in a northerly and more Caucasian direction. These are all potentially more inflammatory issues than how many miles of this or that border barrier Congress should fund this year (or what to call it). And conservatives guess, with good reason, that the idea of “merit-based” immigration sounds more reasonable than the proposition of deporting Dreamers. It’s all getting more complicated. 5. The White House is a never-ending chimera. Topping it all off, of course, is a president who (a) made immigration restrictions a signature issue in his winning 2016 presidential campaign, and (b) regards himself as a master deal maker, a reputation that took a big hit when the last government shutdown ended with the White House largely on the sidelines. On multiple occasions, Trump has seemed willing to cut a deal only to be reined in — indeed, all but overruled — by his nativist-leaning staff. The administration earlier leaked a “must-have list” of policy changes — basically the entire agenda of the New Nativists — as the price for Dreamer protections. Just yesterday, however, White House press secretary Sarah Huckabee Sanders announced Team Trump would send over a “legislative framework” for an immigration compromise to Congress next Monday, without disclosing any details. Then the president himself, at a surprise press-briefing appearance, allowed as how he’d support letting Dreamers “morph” into citizens after “ten or 12 years,” whatever that means. As the panic that emanated from conservatives circles on January 19 when the president summoned Chuck Schumer to the White House showed, no one is entirely sure what President Trump will do at any given moment. Yes, he’s got Miller, Kelly, and Breitbart News shouting in his ear that he cannot let this opportunity go by to force a radical change in immigration policy. But a change of heart — or direction — is always as close as his Twitter account. Given this muddy landscape and the high stakes involved, anyone would be foolish to confidently predict a deal before February 8, or soon after. And this time, if the government does shut down over immigration policy conflicts, there’s probably no longer the option of another short-term suspension of hostilities. It could get ugly for real.